As the HP Spectre 13-v000nd laptop is still fairly new I was surprised that Ubuntu Linux installed without any mayor issues, all hardware seems to work just fine straight from a clean install without any custom modifications to settings, drivers or modules. 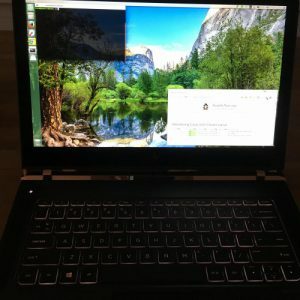 The track-pad is fairly sketchy with random movements when you try to click on something, but it has the same behavior on windows (although it is a bit less than under Ubuntu) and has been mentioned in a number of reviews of the HP Spectre as an common issue. If you however only use a ‘touch’ press instead of a full click the issue seems to be gone, so this might be an issue that will be fixed by HP in a firmware upgrade sometime soon. After a few hours I already got used to ‘touch pressing’ and as I mainly use an Bluetooth mouse the track-pad issue won’t bother me that much. Battery live is about 5,5 hours while actively using the machine and with screen brightness at about 90%, which is not to bad as my first test on windows was about 6 hours. 1) Create a Ubuntu 16.04 USB stick. 3) Enable legacy support mode in the BIOS (system -> boot options).